"Bannerstone" is the name given to a variety of beautifully-crafted stone artifacts. 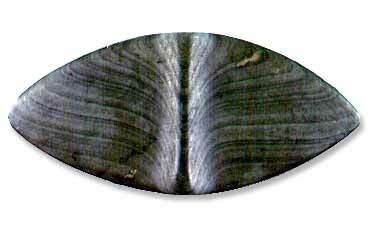 The majority were made from slate and they range from simple hollow tubes to elaborate winged forms. Some bannerstones likely served as weights or decorations for the atlatl. Others are too large and ornate to have worked on a functioning atlatl. Perhaps these were used on symbolic atlatls that served a social role equivalent to the giant keys-to-the-city sometimes presented to dignitaries by modern city officials.